January turned out to be a productive month hobby-wise. I started out working on Dark Eldar, preparing to convert 20 Dark Vengeance Cultists into Wracks (which I still may tackle at some point) and then turning back to my unbuilt / unfinished Space Marine kits. One of my biggest detractors from diving head first into a new army project is the fact that I have so many incomplete models from my earlier armies. My Necrons are in a good place at this point, but I have to be honest, I'm not happy with my Raven Guard at all. Oddly enough, one of the reasons I picked the army in the first place was it seemed to have a simple, easy to paint scheme (I also enjoyed the fluff when I got around to reading it). Unless you are gifted in the art of highlighting black armor, this paint scheme is one of the more difficult ones to pull off well so they pop on the tabletop. I dread the thought of highlighting all the black armor on my bikes -- this is why they look exactly the same as they did the night I "finished" speed painting them to the minimum requirement for NOVA 2 years ago. I enjoy the way the army plays on the table but really wish it looked better doing so. I'm really pleased with how my Necrons turned out appearance-wise, but not as into the way that army plays (there's a noticeable lack of speed and in general, the 'crons are pretty boring). I want my future armies to be fun to play AND look good. Back in the day before I picked an official codex chapter, I had narrowed my list down to 3 armies: Raven Guard; Revilers; and Raptors (all from the same gene seed, but completely different paint schemes). Ultimately, I went with RG because I didn't feel I could pull off painting the Reviler logo or the Raptors camo-greenish-yellow armor. Most only have the first layer of paint on them, but a good 25% of them are close to done (minus the bases). It's been a good month though. I feel like I'm finally coming out of my painting slump and am really enjoying this project. Once all of this is done, I'll have no other outstanding kits to distract me from working on my Dark Eldar, I promise ;) I'll try to get some pictures of these guys up soon. Hey Joe. 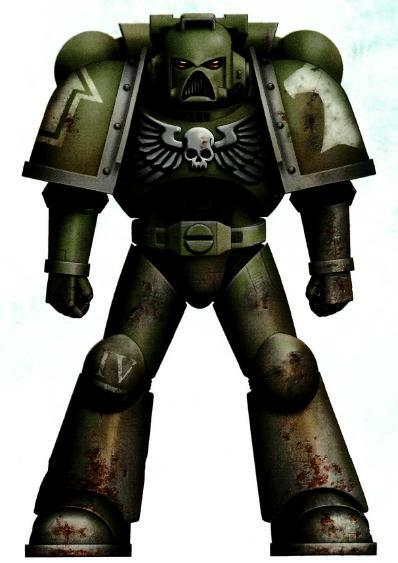 The Raptors are one of my favorite Space Marine armies too, infact I was looking into starting them too. If you dont feel you can paint the chapter symbol then perhaps you should check out the Mentors shoulder pads sold by GW. Its pretty much the exact same symbol. As for the paint scheme? Well I believe the image of a Raptor you posted above came fro how to paint Space Marines. A lot of the images of chapters were photo shopped so I wouldn't worry about trying to match it exactly. Citadel how to paint Tanks has a nice Raptor recipe, It used a Knarlock Green basecoat followed by and Gretchin green midtone and finished of with a rotting flesh highlight. Looking forward to seeing this project progress and hope this helps! Awesome suggestion Snake88, thanks for linking those Mentors shoulder pads! I'm definitely going to give those a try. I've been using 2 non-GW paints for the basecoat and midtone, then highlighting with Rotting Flesh (love this color), but it's good to know what the official colors are.